Some sources have speculated that the two actors who played Sherlock and Watson in this adventure had their roles revered prior to production. But who can tell, eh? Unless you check out the following 72 minute movie made in 1933. It was Directed by Edwin L. Marin; and Starred: Reginald Owen, Anna May Wong, Warburton Gamble, with June Clyde. Good evening, Thaddeus Merrydew (lan Dinehart). Please allow me to formally introduce myself. My name is Sherlock Holmes (Reginald Owen) and this is my associate, Doctor Watson (Warburton Gamble). Now one of the main reasons we've paid you a visit at your law practice, today, is because I believe two of your clients have perished under very mysterious circumstances. To my knowledge both of them have committed suicide fairly recently, and in their will they have bequeathed their fortunes to parties unknown. So, old bean, I was wondering if you could tell me any more about this matter? 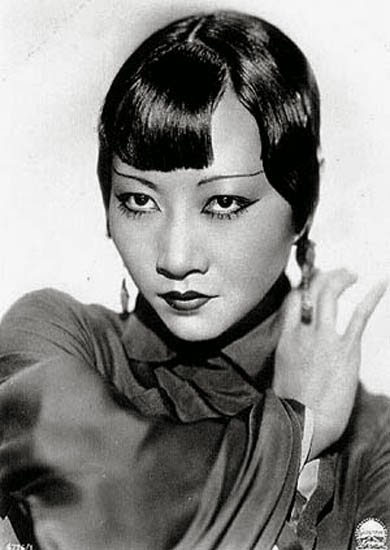 And if so, maybe you, Mrs. Pyke (Anna May Wong), or even someone else associated with your elusive inner-circle -- aptly named 'The Red Ring' -- will be able to point me in the right direction and finally solve this case? Huh? What's that you say, Mister Merrydew? No. You won't help me? Ah-huh! Fair enough. I suppose you have your own reasons for denying me any more... coff-coff... access. But then again, that's most probably why what next transpires all goes shopping when I put on a disguise and get an old man drunk. As a riddle in the newspaper lends a helping hand - Eileen Forrester (June Clyde) is more jumpy than an rubber band - an elusive inner-circle is lead into a deadly trap - and at the end of the day, watch out folks, Inspector Lestrade (Alan Mowbray) say's I'm a very cleaver chap. Now to be completely honest with you, film fans, I didn't think I would enjoy watching this 1933 version of 'A Study in Scarlet' for two very specific reasons. Firstly, the actual story-line presented never followed similar lines to the original source material. And secondly, the actor who played Sherlock in it didn't look anything like him at all. However, once I managed to put these two nagging doubts to one side, and allowed myself some time to just 'be' with the movie, I eventually began to warm up to this adventure in more ways than one. Initially I would have to say that Reginald Owen's does play a pretty decent rendition of Sherlock Holmes despite sporting features of a more bulbous variety. I'm sure if you can give him half a chance -- like I did -- you'll notice he bestows his character with a certain level of authenticity. As somehow he almost epitomizes Holmes in posture, diction, and clarity, whilst managing to play dress-up in a couple of comical yet elusive scenes associated with the plot. Also, I best mention how the supporting players really supported this picture in both scope and tone. Although some of them were seemingly used as 'exposition devises' to serve the conceptual premise -- regrettably, Doctor Watson was one of these people -- the villains were ultimately villainous, and it was nice to see how it portrayed different classes of character throughout English society. Honestly, dear reader. Without straining too hard I'm nigh on positive you could tell who were the cockney 'working-class' people, who were the stuck-up toffs, and who were the more dubious personages that you should keep an eye on. What's more, I have to applaud how the overall production looked pretty good on the screen, especially since it was made way back in 1933. As for the final story-line though, well, as I said, I would have preferred it if it stuck to its original source book. From my point of view what should have been a fairly basic 'espionage / murder mystery' scenario, ended up being a somewhat sporadic story that jumping around from scene to scene to scene like a head-less kangaroo. Anyway. By now I'm sure you know what I thought about this very timely yet daring Sherlock Holmes film. However, what about the following filmic-facts? (1) 'Fox Film Corporation' first released this production on the exact same day Hal Roach released the Laurel and Hardy classic, 'The Devil's Brother'. It was on the 14th of May, 1933. 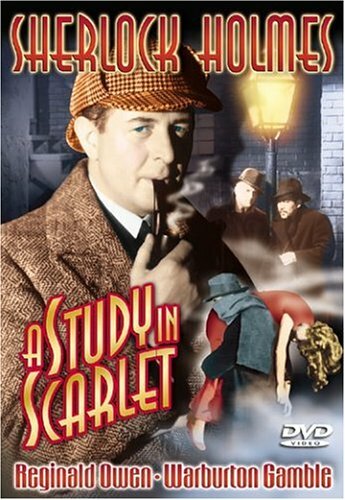 (2) Loosely translated, this project was entitled 'A Study in Red' in Brazil; and 'Sherlock Holmes and the Scarlet Letter' in Finland. (3) The majority of this movie was shot at Sunset Boulevard's 'Tiffany Studios', located within the Californian state of Los Angeles. 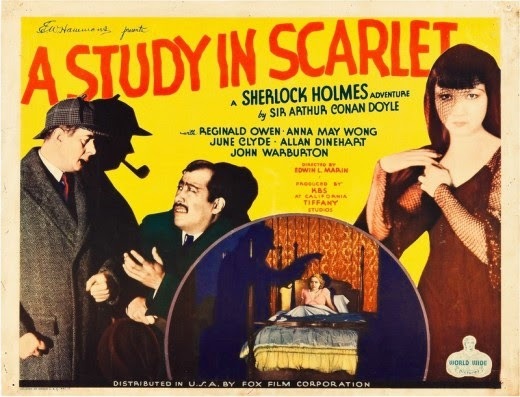 (4) Even though this adventure clearly states that it was based on the Sir Arthur Conan Doyle 1877 novel, 'A Study in Starlet', it is not. Instead, it's an original screenplay written by the French author, Robert Florey. (5) Now if you took any notice of my previous fact, you might like to know that the main reason the producers of this flick didn't want to use the original source material, was because it cost too much. The skin-flints. (6) On more than one occasion throughout this story Sherlock and Watson's famous address was conveyed incorrectly. Rather than saying it was 221-B Baker Street, they claimed that it was at 221-A Baker Street. (7) Just like Jeremy Brett, Carleton Hobbs, and Patrick Macnee, Reginald Owen's also donned the mantel of Watson on stage prior to playing Holmes in this picture. 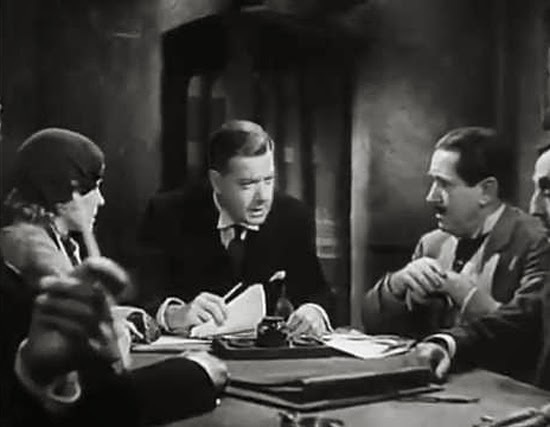 (8) After this adventure cleaned up its act, Reginald Owen starred in the drama, 'The Narrow Corner'; Anna May Wong starred in the crime-caper, 'Tiger Bay'; and Warburton Gamble starred in the comedy, 'By Candlelight'. 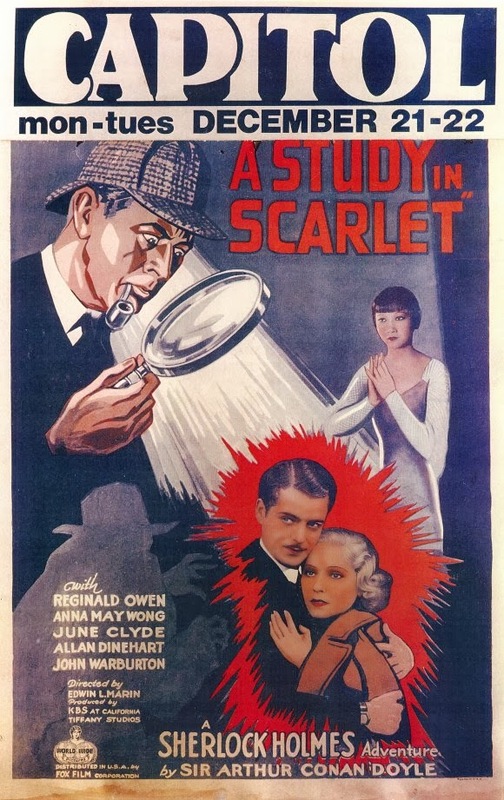 Overall I'd say this 1933 version of 'A Study in Scarlet' was a pretty decent adventure to spend some time with. So if you're a Sherlock Holmes fan, and want to see a more alternate yet authentic take on his persona, here, this one is for you.